Well, now that 3D hubs is bringing the sharing economy to the technology, you can probably get it done just down the street. For most people, 3-D printing probably seems like little more than hype. We’re constantly hearing about the prospect of 3-D printed food, 3-D printed widgets, and even 3-D printed organs. But where is all this stuff in daily life? It’s coming–according to McKinsey, 3-D printing could have a giant economic impact in the near future–$230 billion to $550 billion per year by 2025 in consumer use, direct manufacturing, and tool creation. 3-D printing networks, where people create models of what they want on their computers and then use 3-D printers elsewhere, may be one of the catalysts in the rapid growth of this industry. This week, for example, 3D Hubs, a 3-D printing network platform, launched (with an undisclosed seed round from Balderton Capital). The Amsterdam-based startup, created by two industry veterans, helps people make money during the 95% of the time that their 3-D printers sit unused–and while giving others access to a local printing network. 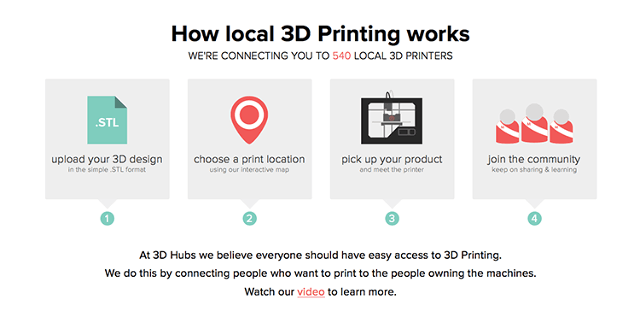 Every major city on the 3D Hubs network is considered a community. Some communities–like Amsterdam, London, and Copenhagen–already have lots of printers and active users. To find a printer, just search in your city. Click on Amsterdam, for example, and you’ll see that there are 29 print hubs listed with their printer type (Ultimaker, RepRap, Leapfrog Creatr, etc. ), the colors they have available, delivery time, print quality, and price per cubic centimeter of material printed. 3D Hubs takes a 15% commission on each order; in exchange, the company makes sure each file is printable, does a price calculation, and offers secure payment.